Hi there! 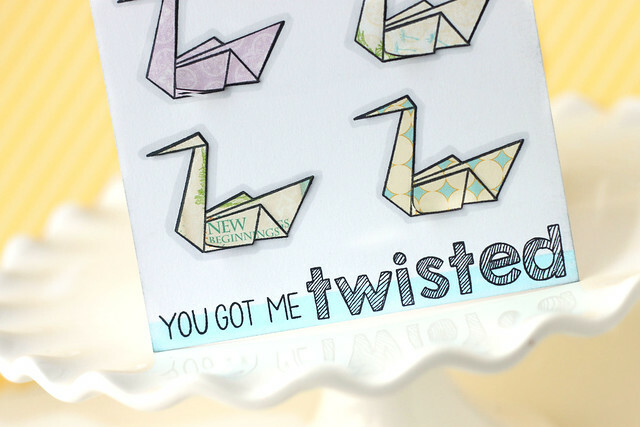 I'm on the mama elephant blog today, showing off a fun card with the new "origami" stamp set. Did you leave to google the song? ha. Each origami bird was paper pieced from patterned paper. I double-cut some of the pieces, to give the card a fantastic 3D look. Because the birds are floating on the card, I grounded each image by tracing a gray outline around each one. I love making my own, custom sentiments. In this case, I pieced together the words "you got me" from different sentiments found in the "True Friend" set, another great new release. 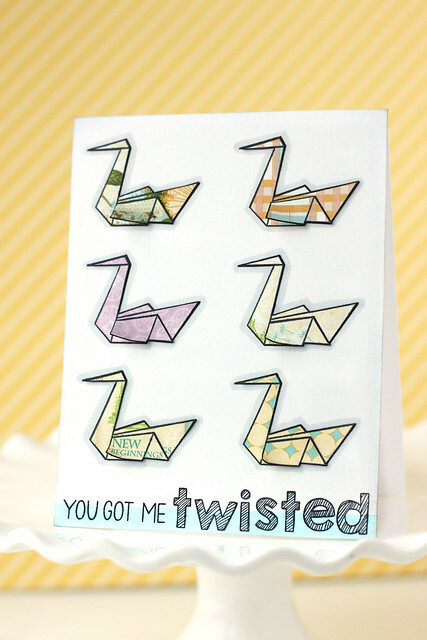 The sketchy letters highlighted "twisted" which I thought worked so well with the twisted paper origami images. It's so so beautiful, Elena!!! LOVE it! Perfect! Love the shading and all that fussy cutting and dimension!